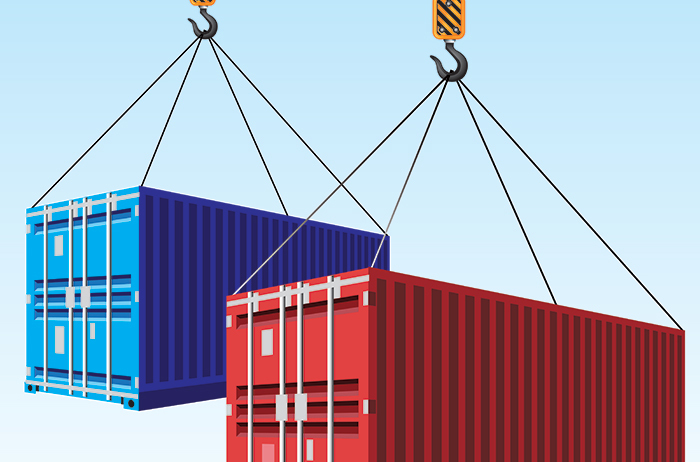 Conflicting and constantly changing information on new container weight regulations requiring shippers to provide the verified gross mass of all export containers points to a chaotic rollout of the rule when enforcement begins on July 1. In a bid to counter widespread misdeclaration of container weight, the International Maritime Organization has placed the responsibility for ensuring the correct weight of loaded boxes with shippers. Through the IMO’s Safety of Life at Sea convention, shippers from 162 countries that are signatories to SOLAS will have to provide the verified gross mass of each loaded container to the terminal and carrier or the container won’t be loaded. But with just four months before the regulation takes effect, the rule remains a moving target, with official sources releasing confusing information and doing little to calm industry nerves. The rule “could raise already chronic congestion at the ports that are slowed by chassis management issues, higher cargo loads from larger vessels and inadequate inland or intermodal links,” Fitch Ratings warned in a recent research note to investors. Many shippers are calling for a delay of up to a year — an option under Article VIII(b)(vii)(2) to the amendment — but the U.S., Canada and Europe have shown no indication they will ask the IMO for more time. Russia, however, said it plans to ask the IMO for more breathing room, while China has been silent, with reports that some ports are preparing for enforcement and others are ignoring it. In the U.S., the Coast Guard said it wouldn’t consider a delay, but more importantly, said that despite shippers’ concerns over how it enforces the rule, it won’t hold shippers accountable. Only carriers and flag states are party to the SOLAS amendment, not shippers, it said. “There is not authority under SOLAS that requires shippers to do anything. I cannot require shippers to do anything,” Rear Adm. Paul Thomas, the Coast Guard’s assistant commandant for prevention policy, said at a recent public session. This creates a bizarre situation in which shippers are responsible for providing the weight data, but the carriers will be penalized if that data is inaccurate. Coast Guard enforcement of the rule will target the carriers, shifting responsibility of compliance to the shipping lines that will have to ensure they receive the correct information from their customers. While government agencies in the U.S. and around the world grapple with the enforcement side of the ruling, the container supply chain is pushing ahead and applying itself to compliance that will come at a cost in both time and money. Perry Bourne, director of international transportation and rail operations at Tyson Fresh Meats, said his company “guesstimates” it could add $250 per box in extra non-value-added services that Tyson won’t be able to recover from its customers. A global Hong Kong-based shipper outlined the huge effort required to capture and input accurate VGMs into company systems before the information can be transmitted to container terminals and shipping lines. Multiple departments must be involved, from the initial brand design, to packaging, procurement, shipping and logistics, he said. This requires a detailed and complex internal program to identify red flags and devise efficient and cost-effective ways to address problem areas. Ultimately, shippers will need to install standard operating procedures on cargo weight that stretch across all products the company makes or outsources. Outsourced products pose more of a problem for shippers because the vendors are usually independent manufacturers. To ensure these suppliers provide the correct weight as required by the VGM rule, a shipper will have to issue a set of procedures to be followed, such as requiring a loading plan for each shipment that will contain the relevant VGM. How that data is sent is another crucial area under careful study. Considering the container volumes involved, it’s generally accepted that the submission of VGM data is best done electronically. But that raises questions about whether exporters have the infrastructure in place. “Many shippers and carriers aren’t certification ready. That is, they don’t have the functionality or processes in place today to easily comply,” Michelle Cummings, vice president of ocean services and partners at technology provider GT Nexus, told JOC.com. Global shipping platform INTTRA estimates that manual documentation is used for as much as half of the roughly 300,000 loaded containers shipped around the world each day. If the VGM can’t get into the hands of the marine terminal in time to use it for vessel stowage planning — a requirement of the rule — trade disruptions on a global scale could result. Work on a digital form is underway that would allow shippers, as well as forwarders responsible for the shipments, to send information critical to meeting the global container weight mandate at least three days before the ship arrived, according to Inna Kuznetsova, INTTRA’s president and chief operating officer. Carriers need the VGM before stowage plans can be made so they can determine how best to store the containers so the vessel is in balance. “Considering a single carrier may ship 50,000 or more boxes out of a major port monthly, faxing a VGM isn’t realistic,” she told JOC.com. The VGM requires a signature from the shipper or forwarder whose name is on the bill of lading, so a phone call won’t work. Carriers — in the U.S., at least — are starting to come to the party. The Ocean Carrier Equipment Management Association, whose members include 18 of the world’s largest container shipping companies, is using the technical experience it gained in implementing the 24-hour advance filing rule imposed after the September 11 terrorist attacks as a guide for how shippers will send VGM declarations to container lines. The other key players are container ports and terminals that aren’t exactly rushing to offer weighing services. As of Feb. 23, the U.K.’s Port of Felixstowe, Jawaharlal Nehru Port Trust in Mumbai and DP World had agreed to weigh boxes for shippers to ensure there are no disruptions to the supply chain after July 1, but that depends on the authorities in their jurisdictions agreeing to the service. The South Carolina Ports Authority said it could provide in-terminal weighing services for containers at Charleston if allowed to do so by the Coast Guard. Yet even as terminals contemplate how they could offer the weighing services, there remain no clear guidelines on what will be required and no industry standard for the terminals to observe. It’s also unclear whether it will even be possible for a terminal to offer an efficient weighing service. Take one of Hong Kong’s busy and efficient container terminals. Under the current container weighing system, the process takes 15 minutes per container. The truck entering the terminal gate slowly drives over a scale that records the weight of each axle, and the total mass is recorded. After dropping off the container in the yard, the empty truck must return and drive over the scale again so the weight can be deducted from the total. This allows a maximum of four containers to be weighed per hour, so to be able to offer any reasonable weighing service, a huge investment in scales would be required, and large scales such as weigh bridges take months to install and set up. It hardly makes a compelling business case. Contact Greg Knowler at greg.knowler and follow him on Twitter: @greg_knowler. ARTÍCULO 2°. – Establecer que el vencimiento para la presentación de la Declaración Jurada —Formulario CM05— correspondiente al período fiscal 2015 operará el 16 de mayo del año 2016, aplicando a partir del cuarto anticipo, el coeficiente unificado y las bases imponibles jurisdiccionales determinadas, según lo establecido en los artículos 83 y 84 del anexo de la Resolución General N° 1/2015.